BOUNCE PASSES: Friday was Cascades Hall of Fame night, and five inductees – athletes Peter Wauthy and Denise Rehman, builders Scott Fast and Ken Fernstrom, and the 1995 men’s soccer team – were celebrated in an on-court ceremony between the women’s and men’s basketball games. ( by Raelyn O’Hara, UFV Athletics communications assistant) The University of the Fraser Valley men’s volleyball team opened 2018 in promising fashion, seizing a four-set win over the Douglas Royals on Friday in New Westminster. The CCAA No. 14-ranked Cascades took the first two sets by scores of 26-24 and 25-18, but the Royals bounced back to extend the match with a 25-23 triumph of their own in the third. UFV closed things out in the fourth, though, by a 27-25 score. The result enabled the Cascades (7-6, third place in PACWEST) to increase their margin over the Royals (5-8, fifth place) in the conference standings. The two teams renew hostilities on Saturday (7 p.m., pacwestbc.tv) in New West. Cascades got off to a quick 5-1 lead in the first set, highlighted by attacks from left sides Nick Bruce and Ben Friesen. They led by as many as six points (17-11) midway through the frame, and while the Royals battled back to tie it 21-21 and 24-24, UFV managed the last two points to take the win. Bruce once again dominated at the net with sturdy blocks and strong hits in the second set which gave UFV an 8-3 lead. The Royals had some strong rallies but UFV maintained comfortable leads at 12-6 and 17-10, and finished off the set from there. Douglas clawed out a win in the third, and the fourth was a hard-fought affair as well. Cascades setter Adam Frederickson ran the offence efficiently down the stretch, though, and Bruce’s dynamic serves helped seal a 27-25 win to close out the match. Fifth-year standout Bruce had a typically outstanding performance: 14 kills, five blocks, three aces and seven digs. But he had plenty of support. Friesen and Matt Whittall notched 10 kills apiece, middles Dayton Pagliericci (eight kills) and Josh Fefchak (five kills) also contributed offensively, and Frederickson registered 42 set assists in what Donen termed “probably his best setting game of the season.” Libero Evan Bell-Foley led the defence with 12 digs as the Cascades combined for one of their most stable passing matches of the campaign. The University of the Fraser Valley women’s volleyball team picked up its most impressive victory of the season to date, knocking off the Douglas Royals in four sets on the road in New Westminster. The Royals came in tied for first place in the PACWEST at 10-2, and owned the No. 2 spot in the CCAA national rankings. But after an inconsistent performance in the first set, the CCAA No. 7 Cascades battled back to win the next three (17-25, 25-19, 25-10, 25-21) and claim the win. The Cascades (8-5) and Royals (10-3) clash again on Saturday evening in New West (5 p.m. start, pacwestbc.tv). After being tied 5-5 early in the first set, the Cascades found themselves behind 10-5 after struggling with their blocks. Keira Fisher brought them out of the rut with two successful serves, but the Royals were able to re-expand their lead to 18-10. Gilray brought Kara Williams and Lexi Edwards off the bench, and while the Cascades weren’t able to erase such a significant deficit, they were able to build momentum. UFV came out swinging in the second set to take an early 4-1 lead. With smart plays coming from the front row and tough serves from left side Kim Bauder, the Cascades surged ahead 12-6. The Royals’ hitters heated up to cut the UFV advantage to 16-15, but the Cascades steadied themselves and won the set comfortably. Hits rained down from both sides of the net in the third set, which saw ties of 9-9, 13-13 and 17-17. The Cascades turned the tide in their favour with a 4-0 run at that point, and they finished off the set from there. Similarly, the fourth set saw close scores early, but the Cascades pushed their way to a 14-9 lead. The Royals got back to within three points, but Williams’s strong serves helped UFV close out the match. Rookie left side Amanda Matsui had an outstanding performance, leading the Cascades in both kills (13) and digs (16). But it was the middles who were the difference-makers offensively for UFV. Fisher (10 kills) and Hanna Hieltjes (seven kills) were both prolific and efficient, with just one attacking error each. “Hanna and Keira were just on fire,” Gilray noted. Williams, playing right side for the first time this season, registered seven kills and hit .333. She also unleashed four aces, and the Cascades collected 14 as a team. Cassidy King (12) and Bauder (11) both notched double-figure digs, and Olivia Heinen racked up 43 set assists. Parmvir Bains caught fire in the fourth quarter to spark a UFV Cascades rally, but the Trinity Western Spartans fended off the hosts down the stretch to claim their first win of the season by an 80-74 score. After leading by four points at halftime at the Envision Financial Athletic Centre, the Spartans stretched the lead to 68-50 at the end of the third after Josiah Allison scored five consecutive points late in the frame. Bains detonated in the fourth quarter, scoring 18 of his game-high 33 points. His triple with 44 seconds left in regulation drew the Cascades (5-9) back to within 77-74, but the Spartans (1-11) hung on in the dying seconds. The Spartans led 37-33 at the end of a closely contested first half, but Trunyan had a huge third quarter to help the visitors build a lead. The fifth-year guard racked up 14 points in the frame, including a trio of three-pointers, as TWU pushed the advantage to double digits. 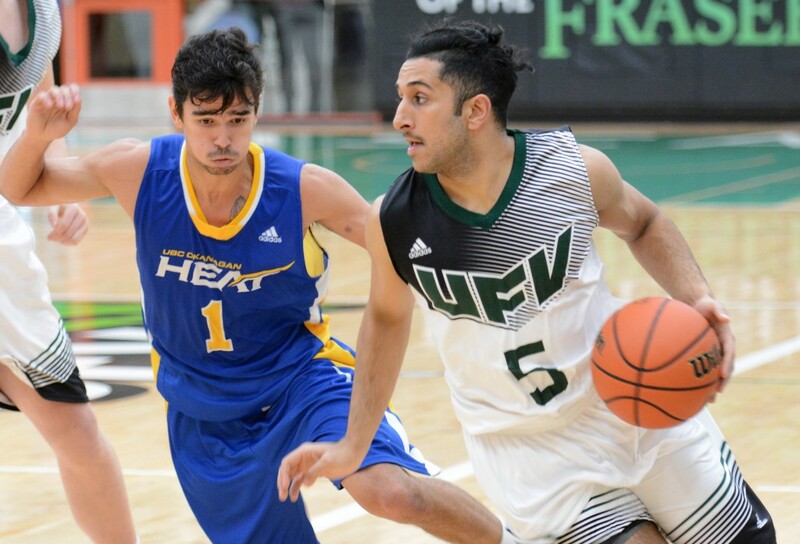 Bains, a 5’10” guard who started the season as a redshirt before joining the Cascades’ active roster late in the fall semester, sparked UFV’s fourth-quarter surge. He had five triples in the final frame, and three of them came in quick succession in the final 2:12 of regulation to make it a one-possession game at 77-74. But Trunyan went 3-for-4 from the foul line down the stretch to close out the game. Trunyan paced the Spartans with 25 points, Vartan Tanielian had 22 points and eight rebounds, and Max Viitala notched a double-double with 15 points and 11 boards. TWU took care of the ball, with just seven turnovers compared to 15 for UFV. Bains’s outstanding night consisted of 10-of-16 shooting from the field and 7-of-11 from downtown. But beyond his career-high 33 points, just two other Cascades scored in double figures: Vick Toor and Kenan Hadzovic, both with 11. The Trinity Western Spartans turned in a tough defensive performance on the road Friday evening, earning a 65-50 win over the UFV Cascades in Canada West women’s basketball action. The Spartans limited the Cascades to 27 points over the first 30 minutes of the game, and held UFV to 34.7 per cent shooting from the field to improve to 10-2. The Cascades fell to 4-10. The first half was closely contested, but the Spartans closed the second quarter on an 8-0 run to stake out a 30-17 lead. They scored the first four points of the third and continued to expand the margin from there, going up 19 points (44-25) on an Ashleigh Barnes jump shot late in the frame. The Cascades found some offensive traction in the fourth, but the deficit was too much to overcome. Sara Simovic paced the Cascades with 17 points, and Taylor Claggett and Shayna Litman both notched eight points and seven rebounds. TWU’s Jessie Brown counted a trio of three-pointers among her game-high 18 points, Tessa Ratzlaff scored 11 points, and Kayla Gordon hauled down 11 boards. “They’re a team that forces you to have to play well defensively,” TWU head coach Cheryl Jean-Paul said of the Cascades. “They’ve got a lot of weapons – Simovic is so good off the dribble, and with the impact their bigs can have on the game. The Cascades hit the road next weekend to face the Thompson Rivers WolfPack. 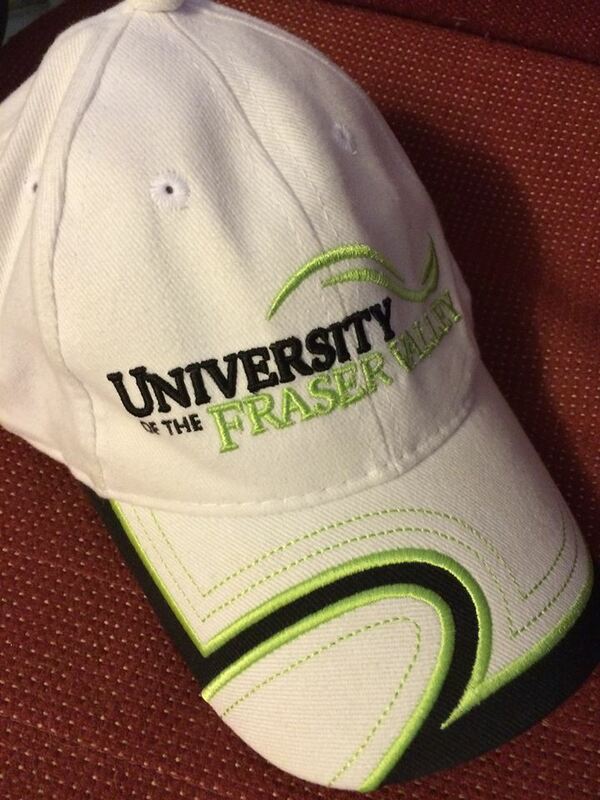 Be the first to comment on "UFV Sports Friday – Volleyball, Hoops Back In Gear"